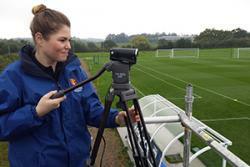 Student volunteer Abbey Forshaw filming at the sports analysis training session.A group of student volunteers have recently been putting the finishing touches to a new community project aimed at bringing sports analysis technology to local grass roots sports clubs in Bangor and the surrounding area. Student Volunteering Bangor’s latest volunteering project offers a unique service to local clubs and individuals and a very unique volunteering opportunity to Bangor University students. Small teams of volunteers attend local club games and training sessions and after filming some of the action can then examine it using specialist analysis software before presenting the results back to the club on a DVD. Sports analysis software and equipment is used by most professional sports teams and athletes to analyse and improve their performance as it is an invaluable tool in understanding how and where improvements can be made to technique and team cohesion. The development of this project has presented Bangor University students with an opportunity to gain experience in this field and it has proved very popular amongst students taking part in sports and exercise science courses. 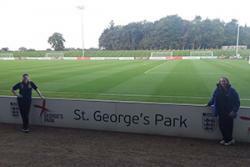 Students Abbey Forshaw and Karen Thomas on their recent visit to St. George’s Park.In October, the team of volunteers were invited to St.George’s Park in Staffordshire, the home of the English Football Association to film Coaching Educations sessions. The trip was organised by Sion Rowlands, Student Volunteering Project Officer who has been involved with the development of the project since the beginning. “We have a growing team of volunteers who are all very interested in gaining experience in Sports Analysis and this is proving to be one of our most popular opportunities for students to volunteer. More importantly, this project offers local sports groups and clubs with the opportunity to benefit from a service which is only normally available to elite teams. We’re very confident that it a unique volunteering project and as far as we’re aware it is currently the only one of its kind”.